Having fled the only world he has ever known, can the Phantom return Meg's love? And can Meg reveal the man within the monster? For a tale of the Phantom that takes a different direction, visit Stef Cole's web page for The Phantom Returns. 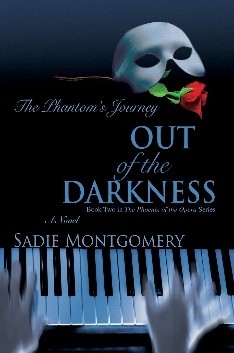 Out of the Darkness: The Phantom's Journey picks up the story from the climax of The Phoenix of the Opera. Relationships have matured; there have been farewells and new beginnings. A new life beckons to Erik who has left his former identity as the Phantom in Paris. With him is the woman with whom he has cast his lot. But can it be true love if they have been shackled together by deceit and circumstances? How can Erik stop living the life of a phantom and become a man? The coachman warned him that he would drive the team into the ground if he did not relent and rein them in. They had traversed many miles since passing the border from France. Erik flicked the whip above the mane of the lead horse forcing it on down the road. Sorrow and anger spurred him on and left him no choice but to careen heedlessly toward his destiny. Behind him Christine. Behind him his life in the Paris opera house, his protective labyrinth of tunnels and vaults, his papier maché world among thespians and divas and the treasure of exotic and fabulous properties with which one could construct one’s own world. Behind him his stage. And the gallows. On and on the team carried him away from all he knew, threatening to abandon him in a world far beyond his grasp, a world he wouldn’t understand or be capable of controlling. With him, a woman he had taken into his heart only to displace Christine whose power over him had led to madness and death. Behind him Christine. He fled like a thief in the night, repudiated, tortured, exhibited, and publicly hanged on the gallows in Paris. Meg told him he had escaped death, but he knew better. He lay in the coffin unable to breathe, buried under a mountain of churned earth, insects tumbled through crevices in the wood and crawled across his lips. He had not escaped death. They had hanged and buried him and brought him back, back to exile him from all the fortifications and defenses he had created, from the world of the opera house cellars that had nurtured him and protected him from emptiness. Hades sitting on his throne in the underworld was no more a god than the Phantom had been in his domain, among the multiple worlds played on his stage. What mercy is this that spits him out on a desert shore like a broken timber from a shipwreck, bereft of home, of all he possessed, of meaning itself? What shelter was there for a ghost dispossessed, whose house had burnt to the ground? This is the second in the Phoenix of the Opera series. In this novel, Erik and Meg must face a test of their relationship. Do they love each other. Are their paths linked? Or are they together only because circumstances have forced them to be so? To find themselves, they must first risk loss. There must be a choice to be made in order to know that one has chosen freely. Erik, the Phantom of the Opera, has escaped the hangman's noose and fled Paris for Italy with his bride, Meg. But the Phantom cannot so easily escape the demons that haunt him. Self-doubt and despair lead to a quarrel with Meg, who injures herself running from him. Despite his tender ministrations, when she comes to, Meg screams upon seeing the Phantom unmasked. Erik flees. The Phantom's journey takes him back to the sordid carnival—and the trauma—of his youth, to the luxurious home of the cruel and decadent nobleman Don Ponzio and his desperate and beautiful wife Lucianna, and to a battle between the man and the monster within. While Erik finds himself trapped in a complex weave of seduction and violence, Meg, recovered from her injury, is beset by suitors, one of whom is the handsome yet ominous Giovanni. But Meg longs for one man only. Will she draw Erik back to her? Can she inspire the Phantom to love himself and her enough to create a life together? Will Giovanni prove an obstacle to their happiness? 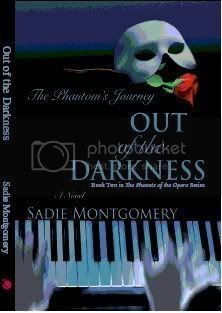 Out of the Darkness continues the story of Sadie Montgomery's dark hero, his beloved Meg, and their stalwart friends Raoul and Christine.